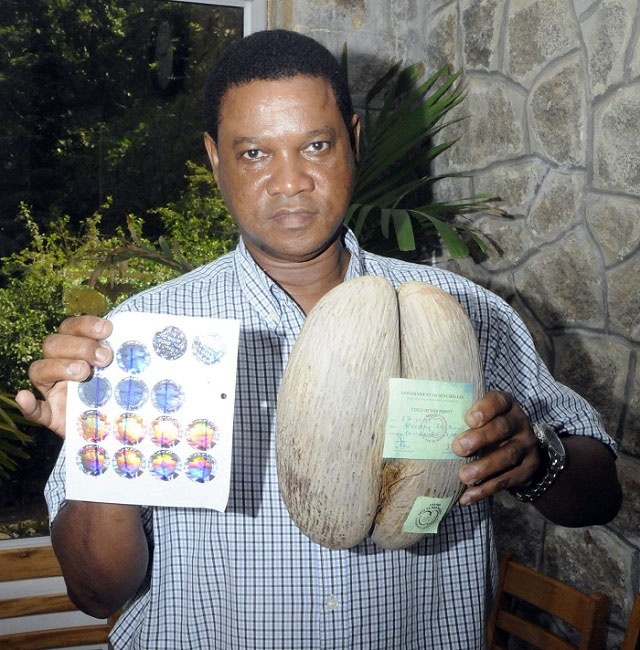 (Seychelles News Agency) - Seychelles is introducing a new holographic coco de mer tag and permit system aimed at curbing counterfeits and protecting the endemic species, said a top official from the department of environment. Around $10,000 has been invested in the new tag which is modern and has holographic security features, making it more difficult for fraudulent imitation. The security features in the new tag are visible when held up to light and include a coco de mer at a precise angle. The tag also contains an inviolability system, which when removed makes the coco de mer illegal. The ministry says the transition between the old tag and the new one will be gradual from now until the end of the year. The old tags can be exchanged for new ones at the office at Aarti Chambers, room 205 in the central district of Mont Fleuri, on Mahe, the main island. Found only in Seychelles, an archipelago in the western Indian Ocean, the coco de mer is the largest nut in the world and grows naturally on Praslin, the second-most populated island and on Curieuse. The Vallée de Mai nature reserve on Praslin, a UNESCO world heritage site, hosts a pristine forest where the coco de mer grows naturally. The reserve is managed by the Seychelles Islands Foundation (SIF). Poaching is one of the hindrances to the growth and re-population of the rare nut, and a two-year survey conducted in 2014 on Curieuse Island confirmed that poaching is harming the population of the coco de mer. The nut is already listed as threatened by the International Union for Conservation of Nature, (IUCN). The chief executive of the Seychelles Island Foundation (SIF) which manages the Vallée de Mai, Frauke-Fleischer Dogley said that a lot is being done to ensure that the reserve is preserved. “We are undertaking research to understand the long life cycle of the coco de mer for example research on mortality rate to be able to establish the number of seeds needed for ensuring the regeneration of the forest. SIF has also developed outreach programme on the need for regeneration of coco de mer and translating scientific knowledge into easily understandable concepts for the local community.